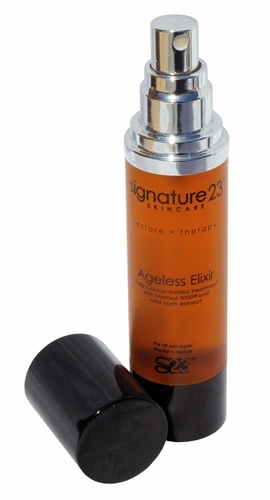 Signature23’s exclusive products are designed to help skin of any age or condition to become beautiful, balanced and healthy. Enhanced with vitamins, mineral and nutrients, their proprietary ingredient (Complex 23) fuels skin with the energy it needs to look its best. Signature23 products do not include fragrance, parabens, dyes, or sodium lauryl sulphates. Here is my review of the Botanical Cleansing Gel, The Vita C Elixir and The Ageless Elixir. This gentle, soap-free, herbal cleansing gel will help free your skin of impurities without stripping its natural defenses. 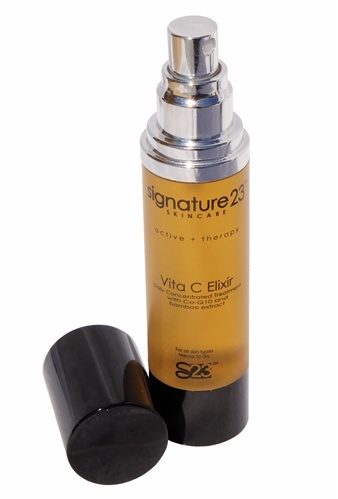 Formulated with "Complex23", their proprietary ingredient enriched with anti-aging antioxidants. Botanical Cleansing Gel will help retain moisture and keep skin vibrant. Enhanced with Beta Hydroxy Acid (BHA) to promote exfoliation, skin will appear clear, balanced and feeling youthful. This product is (soap free with no harsh detergents, frees your skin of impurities, dissolves skin cell buildup, and is loaded with rich antioxidants, and contains Complex23TM helps boost vitality). The Botanical Cleansing Gel is a wonderful soap-free cleanser. This is one of my favorite products from the line and left my skin feeling very clean and soft without drying it out. Perfect for all skin types, especially those with sensitive skin like myself. I highly recommend trying this product. A botanical treatment promoting cellular energy, the rich antioxidant formula helps replenish lipids lost due to aging, dehydration and environmental factors while bamboo extract helps to deliver and lock in cellular moisture. This product says it (provides energy to the cells, boosts the skin's natural defense mechanisms, protects against free radicals and increases blood circulation). Vita C Elixir does everything it says it does. I noticed a more even skintone and felt really refreshed after using this product. It's perfect for travel and fits right in your purse. It's great for summer or winter seasons because it's also a spray, so you can spritz and go! It is very light and refreshing and is perfect for all skin types. This product did not cause any skin reactions and I highly recommend this one. A botanical treatment promoting cellular energy, Ageless Elixir helps to reduce fine lines and even out skin tone leaving skin fortified, firmer and more youthful. Matrixyl 3000® repairs skin at the cellular level. This product says it (promotes cellular energy, help reduce fine lines, leaves skin fortified and firmer and contains skin conditioning agents). Ageless Elixir is similar to the Vita C Elixir because it's a light, refreshing spray that you can take with you on the go, only it's designed for ageing skin. I really noticed a different in the way my skin looked. It looked more even toned and my fine lines were less noticable. This product did not break my skin out or cause any negative reactions and I highly recommend it for dry, mature or ageing skin. I love this line because it's made with the highest quality natural ingredients while utilizing active botanicals, anti oxidants, peptides, and amino acids to deliver the best skincare. Dedicated to creating safe and effective products, they combin the advances in skincare science with essences from nature, to promote healthy skin now and for the future. I highly recommend you try to their products and see the results for yourself. To learn more or get yours, please visit Signature23 at http://www.signature23.com and follow them on twitter at: http://twitter.com/Sig23. I love the Crystal Microderm. Can't live without it! The crystals have helped with the texture of my skin!! Also, love the tingly refreshing feeling it leaves my skin. My favorite is the night cream and the ageless elixir. I have never used a hydrating spray before. Now I use it each morning and night faithfully. I'm sixty years old but my skin doesn't look like it. Also at my age many other skin care products make my skin break out. Signature 23 products are gentle to my skin. I will only use these products from now on.Thanks!!! !Can you make some new products like sunscreen? I love Signature 23 products. The cleansing gel is perfect for cleaning my skin without irritating it. I love the easy spray on products. My favorite is the Crystal Microderm. I use it twice a week for a deeper clean and my skin has never looked better. My husbnd and I love the scrub- and I love the light weight yet effectiveness of the daily cream. Just started using Clear Skin Elixir and love it! My pregnancy acne is going away, finally =)! I love the Vita C, especially when I was breastfeeding, as it kept my skin hydrated. I have very sensitive skin and have always had to be careful as to what I put on it. I use the cleasing gel daily, and love the way it makes my skin feel. I also use the day cream everyday and LOVE the tangerine scent. Keep the products coming!